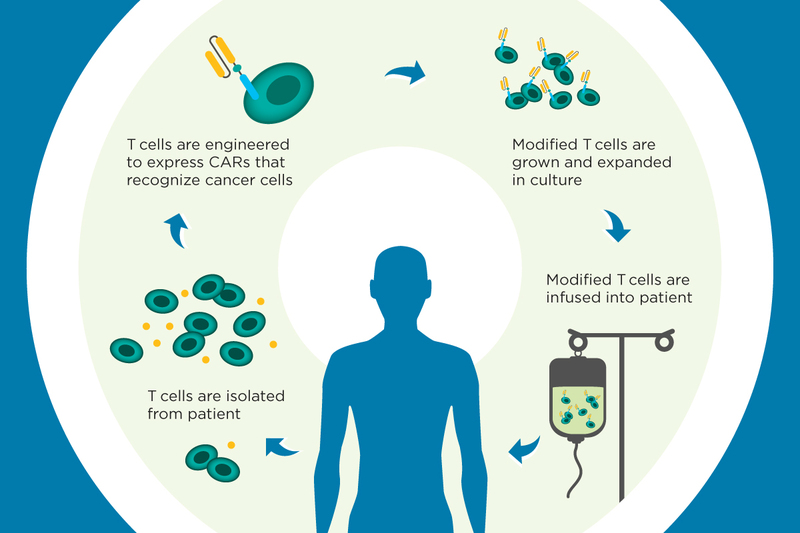 T cell immunotherapy involves engineering a patient’s own cells to recognize a protein present in cancer cells, enabling them to seek out and destroy the cancer. Cell therapies, a promising new type of cancer treatment, aim to boost the immune system by giving immune cells the information they need to better recognize tumor cells as foreign and attack them. These therapies are being used to treat a few types of cancer, with more trials planned. CAR T cell therapy was first developed at MSK. A chimeric antigen receptor (CAR) helps T cells identify tumors. These T cells then recognize tumors as foreign and attack them. CAR T cell therapy is being used to treat leukemia and other cancers. When people think of treatments for cancer, they likely think of surgery, radiation therapy, and drugs — both traditional chemotherapy and, more recently, targeted drugs. Increasingly, however, cancer therapies may be vaccines, antibodies, or therapies made from whole cells. Cell therapies, sometimes called “living therapies,” are an especially promising and rapidly growing area of cancer research. One approach that’s been pioneered by Memorial Sloan Kettering researchers, led by investigator Michel Sadelain, is called CAR T cell immunotherapy. This type of targeted immunotherapy aims to boost the immune system by giving immune cells the information they need to better recognize tumor cells as foreign and attack them. The technique involves filtering white blood cells called T cells from a patient’s blood and introducing a new gene into those cells. A disabled virus called a vector is used to carry the gene inside the T cells and insert it into the cells’ genomes. The gene programs the T cells to make a chimeric antigen receptor (CAR), which enables them to recognize a specific protein that’s present in cancer cells. The CAR T cells are then grown in the laboratory and infused back into the patient, where they seek out and destroy the cancer. CAR T cells help the immune system to recognize and destroy cancer cells. CAR T cell therapy is currently being evaluated in the clinic at MSK for certain types of leukemia and lymphoma. In this approach, T cells are genetically engineered to recognize a protein called CD19, which is found on the surface of blood cells called B cells. In the largest study reported so far, for adult patients with B cell acute lymphoblastic leukemia — a rapidly progressing form of blood cancer — a report published by MSK researchers last year found that 88 percent of patients responded to the therapy. In late 2014, the US Food and Drug Administration granted MSK Breakthrough Therapy Designation for its CD19 CAR therapy. CAR therapy is also currently being studied at MSK for the treatment of a type of sarcoma (a cancer of the soft tissues) as well as advanced prostate cancer that has stopped responding to other treatments. Plans are under way to begin trials for other kinds of cancer as well, including tumors of the chest cavity — mesothelioma and certain lung and breast cancers — and ovarian cancer. Your last paragraph states that this CAR therapy is being studied for the treatment of a type of sarcoma.....which SPECIFIC type of sarcoma is being studied? I'm interested in knowing the physicians' and/or researchers' thoughts/opinions on cannibis oil for cancer treatments. There has been so much posted about it in mainstream & social media. If it can truly help, why isn't it being implemented? I, too, have been researcing CBD (I have stage IV invasiv lobular breast cancer). I am struggling to determine the correct dosage; responses from different dispensaries and individuals varies greatly. Any information would be greatly appreciated. Thank you. I am a three time survivor of Leiomyosarcoma . The treatment has been three major surgeries with partial organ removal to insure no spreading.. And aggressive chemo treatment.I am now cancer free and have been for 1 1/2 years. My last surgery was ar MSK with Dr. Same me Yoon. I am now taking Afinitor 10mg every day. Is there anything else I should be doing so I don't become a fourth timer. I have scans and MRIs every three months. I now have Lymphadema in my leg from my last surgery. Any ideas? Is there any immunotherapy being offered by trial or otherwise for endometrial cancer, Stage 4? Martha, we do not currently have any immunotherapy trials for endometrial cancer. If you’d like to like to speak to one of our doctors about the treatment options that might be available, you can call 800-525-2225 or go to http://www.mskcc.org/cancer-care/appointment for more information on making an appointment. Thank you for your comment. Hello, I am very worried about a 7 year old girl who suffers from TCell Leukemia. It is resistant to chemiotherapy. What can I hope from cell engineering? I have lots of hope after reading about your work. Julie, we recently launched a clinical trial for pediatric T cell leukemia using engineered cells. You can learn more about the trial here: http://www.mskcc.org/pressroom/press/msk-opens-pediatric-car-t-cell-cli…. The trial will be taking place in New York and Boston. Thank you for your comment. Julie, the current trial is only for this subtype of ALL, but there is research under way to offer similar cell therapies for other types of leukemia in the future. If Suzanne’s parents would like to find out about what current trials at MSK might be appropriate for her, they can call our Department of Pediatrics during regular business hours at 212-639-5954. Good Afternoon, I used the keyword search of "breast cancer" with the immunotherapy tag and this along with several other article links presented. Although I haven't read the other links yet, are there immunotherapies currently being used in the clinical setting for breast cancer or perhaps are there immunotherapies being used for breast cancer in the clinical trial setting? Also if I may what trial level has immunotherapy reached? You can also learn about related work here: http://www.mskcc.org/blog/new-immunotherapy-approach-breast-shows-promi…. In the coming weeks, we’ll be sharing a video from a talk we did on Monday about how immunotherapy works, so please stay tuned for that as well. Thanks again for your question. You can also learn more by giving us a call at 800-525-2225. Is or when will this study become available for Mesothelioma patients? Paul, the trial is expected to begin enrolling patients in the next few weeks. You can find out more about it here: https://clinicaltrials.gov/ct2/show/NCT02414269?term=15-007&rank=1 If you’d like to make an appointment with a doctor at MSK to find out more about the trial, you can call 800-525-2225. Thank you for your comment. Gerardo, lamentablemente, no podemos ofrecer consejo médico específico en nuestro blog. Si tu esposa le interesa hacer una cita para consultar con uno de nuestros especialistas, por favor llame a nuestro Servicio de Referencia Médica al 800-525-2225. Ellos podrán contester tus preguntas. Para más información, visita esta página: http://www.mskcc.org/cancer-care/appointment. Gracias por su comentario. Is this study available for urothelial carcinoma patients? Rebecca, this type of therapy is not yet being offered for urothelial carcinoma. If you’d like to learn more about the studies we do have open for treating this disease, you can go to https://www.mskcc.org/search?keys=urothelial+carcinoma&label=clinical_t… Thank you for your comment. My husband is being treated at UCLA for advanced metastaic prostate cancer that has recently reached the liver. He has been resistant to every androgen-blocker and there does not seem to be any treatments left. Would he be a candidate for a trial with this new therapy? Karen, to find out whether this trial might be appropriate for your husband you can call 800-525-2225 to find out about making an appointment for a consultation, or go to https://www.mskcc.org/experience/become-patient/appointment for more information. Thank you for your comment. If your uncle would like to find out which trials at MSK may be appropriate for him, he can call 800-525-2225 to find out about making an appointment for a consultation, or go to https://www.mskcc.org/experience/become-patient/appointment for more information. Thank you for your comment. Who does one contact to receive CAR therapy for treatment (or trial participation) of advanced prostate cancer that has stopped responding to other treatments? Donna, if your loved one would like to find out about which trials at MSK may be appropriate for him, including CAR therapy, he can call 800-525-2225 to find out about making an appointment for a consultation, or go to https://www.mskcc.org/experience/become-patient/appointment for more information. Thank you for your comment. Hi, My Dad is 68 years old and has relapsed following 4 months of remission with AML once again. Is this living therapy an option for relapsed acute leukemia? Thank you for your time. Dear Laura, we are sorry to hear about your dad’s relapse. To find out if he is eligible for this therapy or other treatment options at MSK, please call our Physician Referral Service at 800-225-2225. Thank you for reaching out to us. Are there any open CAR T cell therapy clinical trials for ovarian cancer? If yes, can you post the link(s) to them. If you are interested in making an appointment to discuss these or other treatment options with one of our specialists, please call our Physician Referral Service at 800-225-2225. Thank you for reaching out to us. is this type of therapy where t cells are modified and reinjected in patients used for patients who are just diagnosed with CLL? If not when does it become viable to use this therapy. The modified T cell therapy is under investigation for many other types of cancer, but it is currently not possible to predict when these therapies will be widely available. Thank you for your comment. My father is at early stage of cll. He has no symptoms yet. Can your hospital treat him with "living therapy" or car t cell therapy?. If your father would like to find out about being treated at MSK and which treatments may be appropriate for his stage of disease, he can call 800-525-2225 or go to https://www.mskcc.org/experience/become-patient/appointment for more information on making an appointment. Thank you for your comment. Hi. My mother is 75 years old and is having AML M2. Is it cureable using Car T cell therapy or any other therapy. Please reply. A K, to find out about what course of treatment would be best for your mother, you can call 800-525-2225 to arrange a consultation with our doctors. You can go to https://www.mskcc.org/experience/become-patient/appointment for more information on making an appointment. Thank you for your comment. I am wondering if there is NSCLC CAR T therapy in MSKCC? Ryan, we do not currently have a CAR T cell trial for non-small cell lung cancer. To see a list of the trials that we do have for lung cancer, you can go to https://www.mskcc.org/cancer-care/types/lung/clinical-trials. If you’d like to make an appointment you can call 800-525-2225 or go to https://www.mskcc.org/experience/become-patient/appointment for more information on making an appointment. Thank you for your comment. My sister has Leukemia ALL, and I would like to know how she can make this treatment. It is still experimental? She is from Brazil. Natalia, we’re sorry to hear about your sister’s diagnosis. This treatment is available only in clinical trials. If your sister would like to come to New York for consultation or treatment, you can contact our International Center at international@mskcc.org or go to https://www.mskcc.org/experience/become-patient/international-patients for more information. Thank you for your comment. Hi! Are there any open CAR T cell therapy clinical trials for Chronic Myeloid Leukemia ( CML ) ? Regina, the CAR T cell approach is not currently being evaluated in chronic myeloid leukemia at MSK, but we do have other trials underway looking at experimental approaches for that form of leukemia. If you’d like to learn more, you can call 800-525-2225 or go to https://www.mskcc.org/experience/become-patient/appointment for more information on making an appointment. Thank you for your comment. I read somewhere that people with other autoimmune diseases are probably not good candidates for immunotherapy because of the increased risk of morbidity and I was wondering if that is true? The safety of immunotherapy for cancer in patients with autoimmunity is uncertain. There is a theoretical concern that patients with certain autoimmune diseases may experience worsening of their autoimmune condition when given immunotherapy for cancer. For that reason, many clinical trials of experimental immunotherapies exclude patients with underlying autoimmune diseases. However, for drugs that are FDA approved, patients with autoimmune conditions may be eligible to receive immunotherapy for cancer and may benefit from it. For a patient with an autoimmune condition who also has cancer, the best thing for him or her to do is talk with a doctor about the risks and benefits of immunotherapy treatment. Thank you for your comment. Hi, I have recently been diagnosed with stage 2b ctcl, are any clinical trials available for ctcl? Wayne, we’re sorry to hear about your diagnosis. We do have trials for cutaneous T cell lymphoma. If you’re interested in making an appointment to learn more, you can call 800-525-2225 or go to https://www.mskcc.org/experience/become-patient/appointment for more information on making an appointment. Thank you for your comment. Does MSK currently have any clinical trials that apply CAR-T technology to multiple myeloma or plasma cell leukemia? Dear Elizabeth, we are actively investigating immune-based therapies and other novel treatments for people with these conditions. Learn more about these trials by visiting https://www.mskcc.org/cancer-care/types/multiple-myeloma/clinical-trials. If you have questions about any of these studies or would like to make an appointment, please call our Physician Referral Service at 800-525-2225. Thank you for reaching out to us. Hi there - thank you so much for your groundbreaking work. My daughter, 5, has Stage 3 alveolar rhabdomyosarcoma, we are almost done with 52 weeks of IVA/VAC/VDC and we had 26 sessions of radiation. There is no sign of her cancer anymore, but as a typical mom I'm worried sick about potential relapses and would rather be prepared. Do you do any trials for rhabdomyosarcoma, is it included in the above mentioned soft tissue sarcoma? Will living therapy be an option for her? Thank you so much for your time. "Nimady"
Nimady, we’re sorry to hear about your daughter’s diagnosis. At this time, there are no trials evaluating the benefit of CAR T cells for this type of cancer, but we do have other trials for rhabdomyosarcoma. To see them, you can go to https://www.mskcc.org/cancer-care/clinical-trials/search?keys=rhabdomyo…. If you’d like to make an appointment for a consultation at MSK, you can call our Department of Pediatrics at 212-639-5954 or go to https://www.mskcc.org/experience/become-patient/appointment for more information on making an appointment. Thank you for your comment.